Spring is in the air, sort of kinda, depending on the day at least. Today I am here to really get you into the spring spirit with a very cute and inexpensive DIY! These adorable miniature birdhouses are a dollar or less with a coupon from your local craft store and they come in a variety of styles to choose from. Let your heart pick its favorite and then get out your paints! For this bird house I decided that it would look so cute in this Lilly Pulitzer pattern of roses. I first started off by painting a base coat of this blue in the shade skjdfb by sfkbksg. You may need two coats depending on color and quality of the paint. Let them dry completely before moving on to the next step! The other colors I used in this DIY are white by Joann's, candy pink by Joann's, green by Applebarrel, and metallic green by Martha Stewart. Here's a close up of some of the flowers. Some definitely turned out better than others. To created these flowers all I did was started by putting white circles in every place that I wanted a flower. Once those were dry, I then took a smaller brush and my pink paint and started making half circles of various sizes around the center of each flower. You'll want to continue this process until the white of the circles is barely visible. To add the leaves I took my green paint and made a little almond shape on the side of each flower being sure to create interest by using different sizes. Here is how the back of the bird house looks. Now don't get me wrong, paint your bird house however you want, but don't forget you can apply this rose technique inspired by Lilly Pulitzer to canvases, walls, and more! I hope you enjoyed this fun and easy Spring DIY! Thanks for stopping by! Hello everyone! It is time for another video on my YouTube channel! Today I am featuring a how-to on a fun DIY home decor project. So here's what you'll need! You will need a jar or vase, nail polish, warm water, paper towels, a toothpick, and a disposable container. I would avoid nail polishes that have special finishes such as glitter, shattered, or those matte finish polishes. These are how they turned out! Now since you can't really see them that well without anything in the jar, I decided to add things to make it easier. Now that you can see the marbled pattern that I achieved on these I'll tell you how I did it! First you will want to fill your disposable container with luke-warm water. Don't fill it all the way up, but to the level that you want your jar to be covered. Then, while the water is still warm pour your nail polish (or polishes) in to the water. You can pour less or more depending on what look you want. Move quickly now to make sure your nail polish does not clump. If you see clumping (for an example, tune in to my video below) do not dunk your jar in. Every time you want to do a new color or dunk a new jar, I recommend resetting the water. This will ensure that your water is the correct temperature and you will get a better marbled look. You'll want to let these completely dry and if you're looking to use the jar for a drink you will need to add a sealant. Always hand wash. If you have any questions I'll be happy to answer them! Thank you so much for stopping by and enjoy the video below! Spring is definitely in the air! I'm getting a jump on Easter things here and created these fun little note cards to give my apartment-mates. These are similar to both my Valentine's Day and St. Patrick's Day ones, so be sure to check those out for different looks. I am officially addicted to making these quick and cute little note cards for my friends. I don't know exactly why, maybe it's the cute size, but I'm gravitating to these more often. I made two versions of these just to show you how you can switch it up a little bit. The techniques on both of these cards are the exact same to the other two kinds. But, just in case you might have missed it, here's a quick tutorial. You'll want to wet all of the colors in the palate you want to use, then puddle water on to your watercolor paper, but not too much water. Pick up color with your paint brush and tap it onto one side of your puddle, let the color move by itself, but if it needs help you can give it a nudge. Clean brush and then add second color to opposite side of puddle. Let the colors converge and make a harmonious blend. Dab your art with a paper towel where the color puddles to quicken drying time. Let completely air dry and then stamp away! These 3 cute stamps are all from Studio g and I'm finally glad I got to use them! I added sequins for some more pizzazz and some splatters for extra flare. I hope you enjoyed these fun Easter cards. I hope you all have a wonderful spring! All products available are listed below. 5mm Flat Round SEQUIN PAILLETTES ~ Premium SILVER Multi Hologram ~ Loose sequins for embroidery, bridal, applique, arts, crafts, and embellishment. Made in USA. Hello there, collegiate! Welcome to my blog! Today we're diving into another College Files post where we explore opportunities on campus and which ones look good on your resume. As a disclaimer, I am in no way an expert on any topics, so this is solely based on personal experience and things I've learned from others. So, let's dive in! Employers love to see that you have clubs on your resume, but if that club also has you doing community service, that's like 10x bonus points! Some clubs that are all over the country include Key club, mission trips of sorts from various clubs, and service groups. There will definitely be varying names for these types of clubs. The one that I'm a part of is Lowenthal Service Group. This one can be a whole range of things. The one's that particularly come into my mind that are at my campus include Colleges Against Cancer, Tigers for Tigers, and Habitat for Humanity. Although some of these revolve around community service, not all of them will, so be on the lookout for what calls your heart. Then, during an interview or a networking event bring up how passionate you are about something and then you'll truly shine your truest self. This is a big one. A leadership role anywhere looks good, but in Student Government, that's also like 10x bonus points! Student Government has several positions that you could be a part of. Look into your college or university government for more information. Don't see your club here? 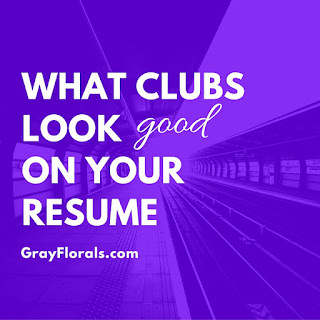 Well, there are plenty more that look amazing on resumes, but I really don't know much about, There's intramural teams, debate clubs, science research groups and more. I hope you enjoyed this college file and come back for more college file posts! VIDEO: Mixed Media Birthday Card // Stamping, Gesso, Stenciling! Happy weekend everyone! Man, it has been a crazy week for me, but now it's time to relax with a little spring break. Today I'm sharing with you the third video I've posted this week. (You won't see that happen too often)! This video is something a little different than usual though. As you probably saw in one of my haul videos, I recently purchased some gesso. Now let me tell you that I have no idea the intended purpose of gesso (okay, I could guess, but I'd be far off. Let me show you how I used it on my project! I created this birthday card for my lovely friend Courtney who has a birthday in April. I originally started knowing that I wanted the theme to be kraft, red, and gold. Then, I added a little white to lighten it up. To get a complete tutorial, check out my video below! This is an A2 sized card which is 4 1/4" by 5 1/2" made out of kraft cardstock. If you're looking for a specific product and where you can purchase it, I'll have links below. Then I cut some white cardstock down to 4" by 5 1/4" to give it some breathing room. Now we dive into the fun stuff! I used two stamps from a Martha Stewart flower stamp set I've had for quite a while. I just absolutely LOVE the way these flowers stamp on paper. So pretty! I inked them up in some Lipstick Red Colorbox ink and randomly stamped the two flowers on the paper. Once that was complete, I attempted to make my own stencils. Although it did kinda work, I'm not sure if my method is a good one. You can check it out in more detail in my video, but let me know if you try it out yourself! I used my palate knife to create the gesso streak in the middle to create a base for my sentiment. Then I created clusters of butterflies using the gesso, sequins, and the punch outs. To finish off the card, I added a sentiment and some gold Heidi Swapp Color Shine. Check out my full process/tutorial below! I hope you all enjoyed! Thank you so much for stopping by! VIDEO: Layout Process Video // Pastel Challenge at the Young Scrappers! Hello everyone and happy Wednesday! Wait...Wednesday?! I know! I'm coming to you out of my usual schedule today in place of tomorrow's usual post to share with you an extra video this week! I am an admin for the Facebook group called the Young Scrappers and we're hosting monthly challenges! If you'd like to join in and you were born after 1990 then just search our name on Facebook and we'll approve your request. 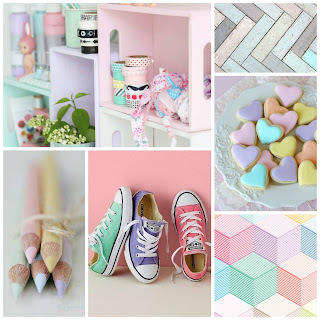 The inspiration piece for this month was this pastel collage made by Marloes. So, after realizing I didn't have much in my stash that included these beautiful colors, I found this collection I have been hoarding by K&Company and Brenda Walton. In my video you will see quite a bit of the collection because I basically sift through all of it to make this layout. This is how the layout ended up turning out and I really like it! Pastels aren't just for baby layouts anymore! This is my cat named Honey and she loves to watch the birds out in the yard. I took these photos this past winter and the lighting was so bright and I loved it! As I stated before, almost all of the pieces used on this layout are from the Brenda Walton collection by K&Company. One thing that is not part of the collection however are these burlap butterflies. You can find out where I picked these up in my latest haul video. They are made by the brand Recollections though. Then, I got to use my brand new flower punches (which you can also see where I got in my latest haul video) by EK Success. To add a little dimension to the layout I used some pink pearls from my stash. The word sticker and leaf are also from the Brenda Walton collection. The doily however is from Wilton and I love using these on my layouts! For more info and details on the layout check out my process video below! Please come and join in our challenge over at the Young Scrappers! We'd love to see your work. Thanks for stopping by! Hello all! Welcome back to my blog! If you can recall way back in February, I made some small cards similar to these for Valentine's Day including a video tutorial! So, if you're more into videos than blog posts, check that out here! I hope you're all having a lovely spring so far. I have a cute project that will get you in the mood for St. Patrick's Day! Being mostly Irish myself, I figured I'd make a little something to give to my friends because why not?! To make these cards I used kraft cardstock and some watercolor paper. All supplies that are available still will be listed with links at the end of this post. So, for this card I puddled water onto my watercolor paper to make a fun shape. Then one color at a time, I added the paint to my pool in layers going in a dark to light fashion. Let this completely air dry before doing anything else. I think it is super fun to add splatters of paint to my projects so I do this step usually after I stamp my sentiment. If your splatters land in a spot you think isn't ideal, just use a piece of paper towel to blot it off easily. Now, once you let that dry, you can add your fun sequins! Once you have your card front the way you want it, you can now attach it to your card base. Both of the stamps I used are from Studio G last year. I hope you are inspired to spread some Irish cheer this season! Thanks for stopping by! 8mm CUP SEQUINS Green. Loose sequins for embroidery, applique, arts, crafts and embellishment. The base of this layout is a 12x12 sheet of paper from Creative Memories. I have a whole pack of this sitting in my stash and it is one of my favorite shades of blue! I then used two sheets of 6x6 paper from the My Mind's Eye Here is Happy paper pad under my photo. I used buttons from Michael's to create a visual triangle as they say and to keep the layout cohesive. Here's a better shot of the beautiful patterned papers I used. I fun chevron and a cute polkadot. This section was really fun to put together because I finally used a transparency! This one happens to be from Basic Grey's Fact & Fiction collection. Then the 3" x 4" note card that you see that says "remember these moments" is from the Dear Lizzy Day Dreamer 12" x 12" paper pad cut apart sheet. The title of this layout is "Oh So Lovely Together" because these two always love being together. The lovely piece is a wood veneer from Michael's that you also saw in my latest haul video. This little die cut piece that says memo on it is also from the Basic Grey Fact & Fiction collection. It's another really shade of blue and kraft. I used some white acrylic paint to add some drips and spots onto various sections of my page to add some more interest. And with that, the layout is complete! The process video is below as well as product links! Thanks for stopping by! Niagara Falls // 12x12 Layout Share! Hi there crafty friends! Welcome to my blog! If you're new here feel free to look around and check out all my tabs for more content! Don't forget to subscribe to my blog for more posts. This layout was super fun to make because, one this is the last layout from Niagara Falls you'll see (because the last one I did is actually already up and you can check it out here)., two because this was a fun color combo to work with, and three I got to use new products! So, let's get into the details, shall we? The background of gray cardstock is by Oriental Trading and then the raindrop paper which I was dying to use is by, yet again, the Dear Lizzy Day Dreamer collection. Also, from the Dear Lizzy paper pad is this cut apart notes rectangle that is so cute! I put behind it a polka dot cut apart from the 5th & Frolic 6x6 also by Dear Lizzy and a half cut doily. To add some more pizzazz I used these star stickers that I got at the dollar store and some of my buttons and gems from my stash. This cluster on the left hand side came together super easily. The yellow ticket is from an Amy Tangerine diecut pack. The wood grain ticket was in my little punched pieces pile and then the branding strip that came on the raindrop paper added some cute arrow under those. You can now see the layers under the photo a little more clearly. The black vine paper is from Colorbok and the Bright Ideas paper pad. Then, the little bit of yellow under the photo is from Studio Calico Hey Day. I used two different stamps on this layout, yay stamps! To be honest, I usually avoid stamping on layouts all together. One because it scares me that I could easily mess up and two because I always seem to mess it up. This time I got it right! I used my Memento black ink and my Dear Lizzy roller stamp to stamp the "hello sunshine" phrase. Then the little arrows that mimic the ones on the branding strip is from the Basic Grey Hello stamp set. Then for the final bits and pieces here we have a chipboard leaf piece by Dear Lizzy. Wow, I used a lot of Dear Lizzy stuff on this! The little pennant wood veneers are from Oriental Trading and the title is made from some white Thickers in the style of Rockabye. All of the products that I can find will be listed below! Thanks for stopping by and I hope you enjoyed! Leave me some feedback in the comments. February Favorites // Crafting, home, & more!